The President of Armenia, Commander-in-Chief Serzh Sargsyan, who is in the Republic of Artsakh in the framework of the cooperation program of the two Armenian states, accompanied by the President of the Republic of Artsakh Bako Sahakian, Ministers of Defense of the two Armenian states, and representatives of the highest command of the Armed Forces today was present at the final combat exchange of fire phase of the military exercise of the battalion located on the southern direction. 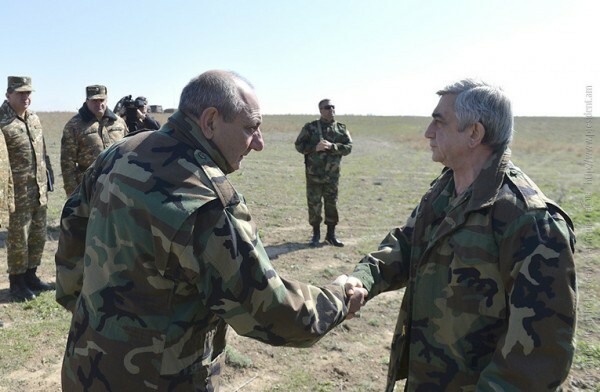 At the conclusion of the military exercise, the President of Armenia handed presents to the officers and military servicemen who were active during the exercise. President Sargsyan also made a statement. I congratulate you all on the successful execution of the training operational mission. Well done. Our nation had hardships throughout our history, our security was not ensured but today, thanks to our Army, the security of our people is in strong hands. Together with you, we will do everything lest anyone tries to undermine our security. The Armenian Army was formed and matured in the last twenty-five years. We were building our armed forces in parallel with military actions but along with that we were endeavoring to learn new skills every day; we need to be more disciplined, to cast heavier blows on the adversary. The same is true today. Even though the combat readiness of our troops is high, we need to get new knowledge daily, we have to get the maximum from our weaponry because the arms by themselves are nothing. Arms become weapon when officers and soldiers are able to master them. Dear Soldiers, I am confident that you become stronger every day, that you become even more combat ready, otherwise the threat will inevitably become a reality, the threat will become a conflict, the threat will become a war and here, in this region, you are the ones who deter the war. I thank your parents for raising you this way; I thank you teachers for educating you, and, of course, I thank you for doing almost the impossible. Be assured that the leadership of the Republic of Armenia, the government will continue to hold as the priority the arming of our Army, the support of our Armed Forces and you, in your turn, by your everyday service assure our people that you are ready to keep our border indestructible.